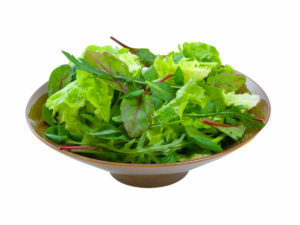 I’m sure you’ve heard that vegetables, especially things like leafy greens, are good for you. But could you honestly eat 14 to 21 cups of greens in a week – and enjoy it? I can now, but it wasn’t always that way. Before I started on a plant-based diet I could barely eat a couple of cups of greens in a week. I didn’t like to make or eat salads. I knew they were good for me, but I seemed to always be throwing away fruits and vegetables. Back then my meals centered around animal sources and refined grains not whole grains and greens. I “strived for five” but thawed at three. The thing is, I was putting the focus in the wrong place. I should have eaten my salad first. I know now that vegetables, especially green leafy and cruciferous vegetables, should be at the center of my meal. I know that animal products should be avoided, or simply used as a flavoring. I know to eat grains in as whole a form as possible and lots of unadorned fruit. If I had done these things in the past, I would have had no trouble getting five servings of fruits and vegetables. But hindsight is 20/20! The good news is you can learn from my mistakes and save yourself hours of time and hundreds of dollars dealing with sickness. Instead, get out and live the life you were intended to live! If you need help getting there, sign up for my newsletter here for sound advice and more, and I’ll let you know when I open the next class. Also, would you take a moment and add a comment about what your favorite green is and how you like to prepare it? Meanwhile, let’s get Whole together. My favorite green is spinach. I love it fresh, or wilted. When I don’t have time to make a salad I at least put my entree on a bed of spinach. My favorite green is lettuce…specifically ice berg. It’s crunchy and makes a good base for other veges to go with it.